Developing nations are increasingly and comparatively more dependent on international trade than the developed countries. The past two decades have seen more nations joining the World Trade Organisation (WTO) to streamline their trade prospects in the global market and maximise on the profits. 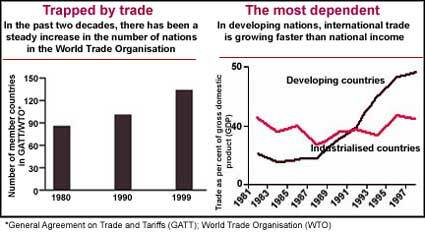 Trade now accounts for 50 per cent of the gross domestic product (GDP) of developing nations. In this scenario, rich nations of the North are pushing for inclusion of environment issues in trade agreements. If they succeed, the poor nations will be hardest hit. Restrictions on trade is, are after all, a weapon that only the rich can wield.